400th Post: Save the Date for the Dinner with Friends! 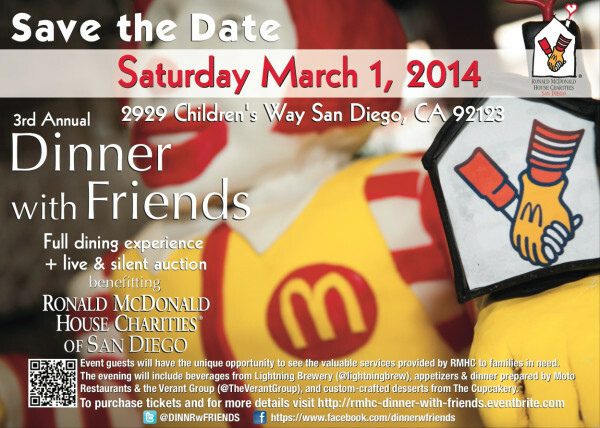 It's time to start talking about this year's Dinner With Friends in support of the Ronald McDonald House of San Diego--it's coming up soon! This is our third event for the San Diego House and has been a great success. Our own Carlos Sanguinetti and Matt Teeter are in charge and have everything running smoothly for the preparations. Soon we will have information about menus and silent auction items! Hospitalized children: Children heal better when families are near. Pediatric medicine: Hospitals require a parent to be present for treatments. By housing parents, we help to make long-term and advanced treatments for children possible. Residents of Southern California: We can all feel assured knowing that we have a resource to fall back on if our children become seriously ill. Volunteers and donors: Through their involvement with the House, volunteers and donors deepen their engagement in civic life and contribute to a stronger San Diego. Alliance has had a commitment to this organization and this event for all three years it has been taking place. We hope that you will join us in making the 3rd Annual Dinner With Friends and even greater success than the last two!